Each autumn, the fireworks show of changing leaves makes up for Beijing’s stifling summers and bitter winters. It’s a generous show, with suburban hills and mountains turning into a carpet of scarlets, sunset oranges and glowing golds. It would take one of the great Impressionist painters to capture the intensity of this ephemeral landscape, or perhaps an artist in red and gold lacquer. The Fragrant Hills west of Beijing are extensively planted with maple trees and every October, throngs of visitors watch the maple leaves flame crimson during the famous Red Leaf Festival. 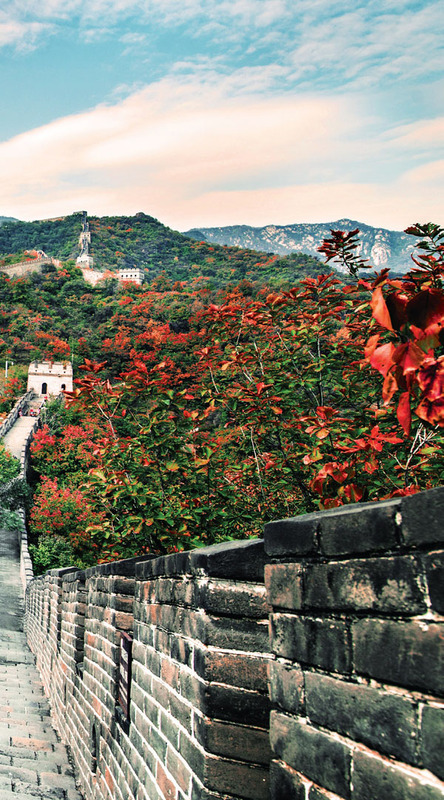 But if the crowds ruin the experience, if not the view, then the best option is the Mutianyu Great Wall in the Huairou District, 70 kilometres and hundreds of years away from central Beijing. 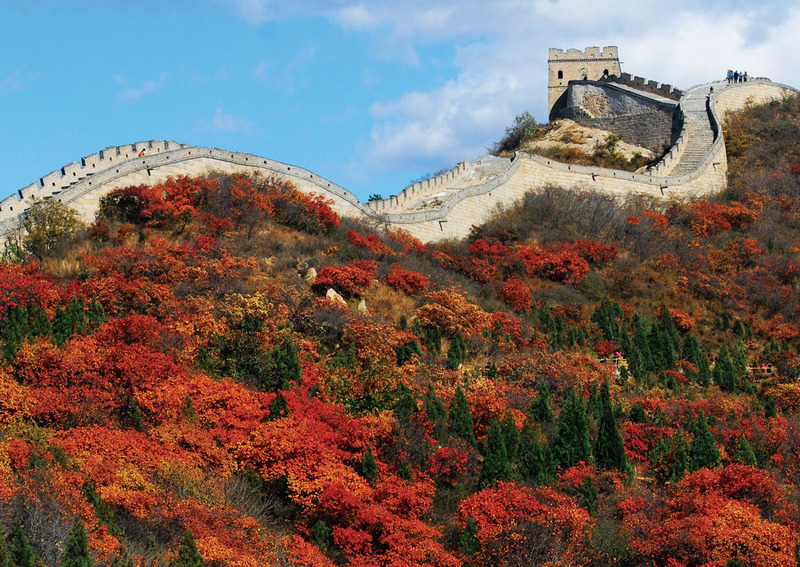 The Great Wall was first begun 2,500 years ago during the Spring and Autumn Period. After Emperor Qin Shi Huang unified China, he ordered that the sections of wall already built by different states be connected. Then and now, the Great Wall is a symbol of the Chinese people and no visit to Beijing is complete without setting foot on it. As throughout history Beijing was the capital of various dynasties, its sections are the best preserved. Known literally as “the prime section”, the Mutianyu stretch is famous for its vistas of hills and valleys and its sense of great history. It is also a perfect vantage point to experience the wonder of thousands and thousands of maple, gingko and smoke trees, many of them planted in the last few decades, putting on their autumnal finery. 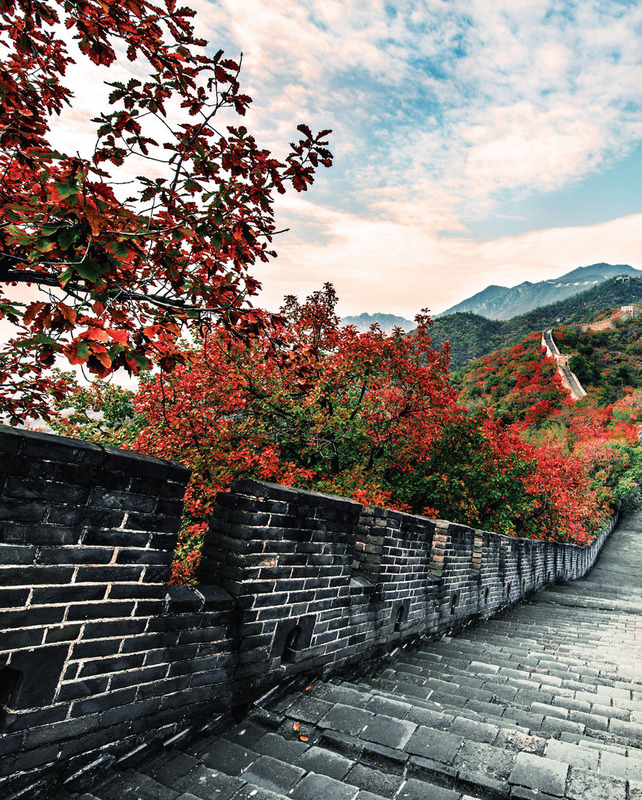 The two beacon towers on the Mutianyu Great Wall provide views of mountains ablaze in all shades of red stretching as far as the eye can see, enhanced by bright autumn sunshine. The view is dazzling, Nature’s last colour display before winter’s blacks and whites settle in. Beijing’s Huairou District was a thriving city as far back as the Tang Dynasty and it still retains its rich cultural heritage. After visiting the Great Wall, it is worthwhile to visit the Hongluo Temple, located three kilometres north of Huairou. It is one of the largest and most extensive Buddhist temples in northern Beijing. Established over a thousand years ago, the extensive temple grounds are home to a pair of ancient gingko trees known as the “gingko couple”. Over the centuries, the venerable trees have created a canopy over the temple’s roof that turns a vivid gold in autumn. 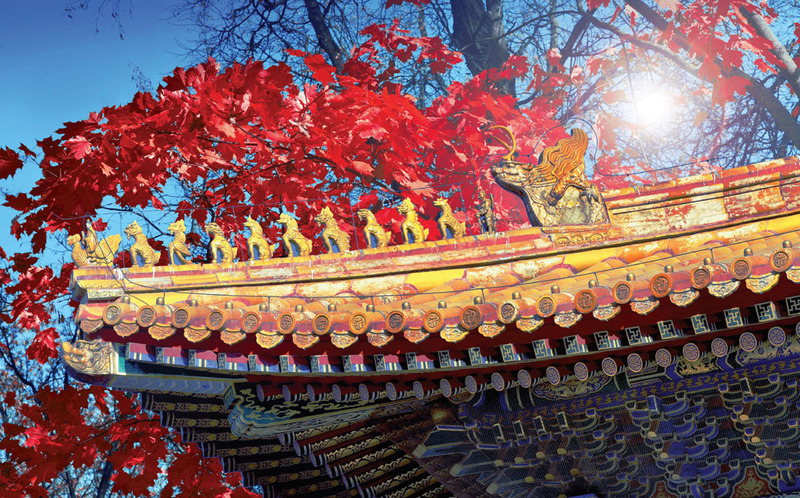 Adding to the vivid beauty of the setting, the temple’s backdrop is Hongluo Mountain, covered with more than 300 hectares of dense forest that in autumn creates a riot of colours, from smouldering yellows to burning reds and even deep purple tones. The entire scene is mirrored in Hongluo Lake, offering breathtaking views for tourists.